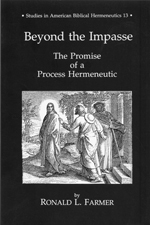 Beyond the Impasse: The Promise of a Process Hermeneutic emerged from my two-decade “quest for a satisfying hermeneutic.” Even before I knew the word hermeneutics (definition-in-a-nutshell: the study of how we create meaning), I was deeply concerned to find a satisfactory methodology for reading texts. After studying a vast range of interpretative strategies in graduate school, I discovered the object of my quest in process philosophy’s understanding of perception and language. In Part One of Beyond the Impasse, I describe the current impasse in hermeneutical studies in general, and biblical interpretation in particular. In Part Two, I demonstrate how the understanding of perception and language found in process philosophy can move us beyond this hermeneutical impasse. In Part Three, I illustrate the process hermeneutic I develop in Part Two by using this methodology to interpret some of the most difficult texts of the New Testament. Contemporary biblical scholarship has reached an impasse. The various programs for bridging the gap between ancient texts and their contemporary theological and ethical appropriation are often unsatisfactory at best and at worst even suspect in their results. We need an effective way to cross that bridge . . . or a new bridge. Ronald Farmer suggests that a “process hermeneutic” holds promise of moving biblical interpretation beyond the current impasse. This is the first comprehensive introduction to a process hermeneutic. It is not, however, merely theoretical discussion, but moves from the side of biblical scholarship to develop a solid methodology for bridging the gap between text and life. Farmer applies his process hermeneutic to a difficult text—Revelation 4-5—and demonstrates this promising method in a piece of solid, responsible, and instructive interpretation. 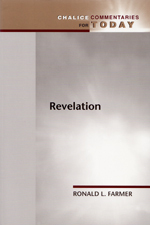 When I was asked by the editorial board of the Chalice Commentaries for Today series to write the volume on the Revelation to John, I jumped at the chance. For years, my research had focused on hermeneutics and on early Jewish and Christian apocalyptic literature, so the invitation appeared tailor-made for me. Chalice Commentaries for Today are designed to help pastors, seminary students, and educated laity who are open to contemporary scholarship claim the Bible in their personal lives and in their engagement with crucial issues of our time. The aim of the series is to offer a better understanding of the biblical challenges to the values, beliefs, and behavior in today’s world as well as our own world’s challenges to the values, beliefs, and behavior in the biblical world.